That was the performance we’ve all been waiting for – the inevitable Kendric Davis breakout, the swarming defense creating points off turnovers, the over 40% 3-point shooting with opponent below 30%, timely buckets and timely stops to create runs and prevent runs. Overall, the team looked happy – the kind of happiness of coming off a buzzer beater into a hostile environment with nothing to lose; the happiness that can laugh off a phantom technical foul and come back from what could have become an insurmountable hole. This was the game to bring the Horned Frogs up from the brink of “Last Four In” territory and into the Bubble’s middle class. There is now opportunity to go on a top-20 winning streak and move on up to upper-middle class level. You already know it is Kansas, you know it is Big Monday, and you already know the Frogs are 2-point favorites. Wait, what? Yes, the betting market actually values TCU over the Jayhawks and are counting on the Schollmaier to provide a home-court advantage…so that means you better show up and you better be loud. 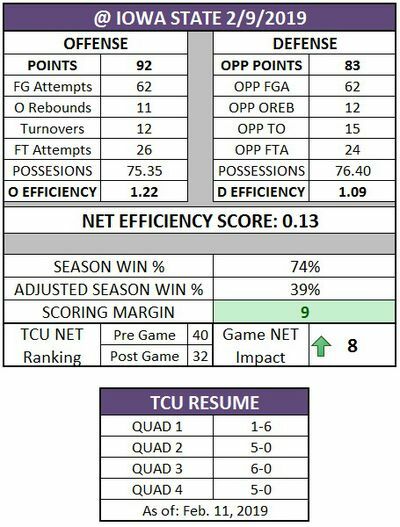 In Lawrence, Dedric Lawson put on a clinic against the Frogs and is certainly the key to breaking down TCU in Fort Worth, especially with the youth movement and deep bench that Kansas has required due to injuries and other absences. Kansas needs some big wins to avoid an end to “The Streak” and every year we get buzz that “no really the streak is in danger this year, we promise”, but every year the Jayhawks put together a run…let’s not allow that run get started tonight. A side NET note: The NCAA released their Top 16 seeds if the bracket was set on Saturday. It is clear that NET and Quadrants will not be the only consideration in seeding battles – #10 Virginia Tech (who went on to lose that day to Clemson, so had no time to complain) was left out, but #21 Marquette was included. 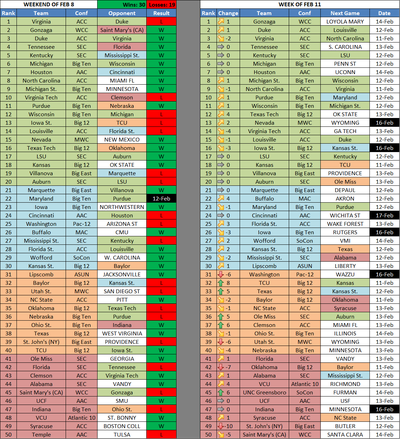 Kansas was a 3-seed despite NET holding them at #18 overall, while #16 Texas Tech and #17 LSU were left out. I expect NET will play a bigger role in determining Bubble decisions and seeding at the lower slots, whereas resumes and strength of wins will make the difference at the top end. · #37 Clemson (↑6) – The Tigers jumped into the Top 50 last week and now have pounced into the Top 40 and their highest ranking all season with the big win over previously top-10 Virginia Tech. Clemson will be an interesting case for the Quadrant-based resume review – currently with only 2 Q2 wins, over #99 South Carolina and #109 GA Tech is not very impressive, but chances are they add wins over #88 Miami, #92 Pitt and #102 Notre Dame to make that Q2 record look strong without being an underdog in any of those games. · #49 St. John’s (↓10) – The Red Storm just cannot get a streak going in either direction – following up a season-defining win at Marquette with a season-damning home loss to Providence. St. John’s will have plenty of opportunity to climb up again, as their only Q3 or worse game is vs. #108 Xavier at MSG, so any win the rest of the way will prove powerful, and it appears likely Chris Mullin’s squad gets to at least the 21-win threshold that would make it hard to keep them out despite the #218 non-conference strength of schedule. · #55 Temple (↓5) – The Owls flew to Tulsa and took a devastating 18-point loss to previously #99 Golden Hurricane, cutting Temple’s time on the Bubble off as soon as it started. · #45 UNC Greensboro (↑6) – The SoCon has become secretly very intriguing. Wofford is undefeated in conference play and has climbed into the NET top 30; #75 ETSU & #56 Furman are tied for 3rd in the conference and could easily steal a bid in the conference tourney; UNCG took a double-digit road win to climb back into legit Bubble consideration. The Spartans now get back-to-back road opportunities at Furman and at Wofford this week to prove they are the toast of the SoCon. An absolutely loaded week of games, with critical impact games every night.